My mom called this morning and asked how the boys were. I responded by explaining they were doing fine, but were just being wild. I didn’t really have a better response for her. She went on to explain how good they were for her while I was at work yesterday for the few hours she watched them. We talked for a second longer about the plans for this weekend and a few other things. As I hung up the phone, I sat at the kitchen table watching my two boys eat their Mac & Cheese they had requested for lunch. Neither one of them was too interested in eating (as usual) and so I encouraged them to eat. A few more bites from each of them and that was it. Both of them left their plates 3/4 full of food and ran off to their room. They were too eager to go play trains, pirates, or whatever else their little minds could imagine. ……flash back to Saturday night……. 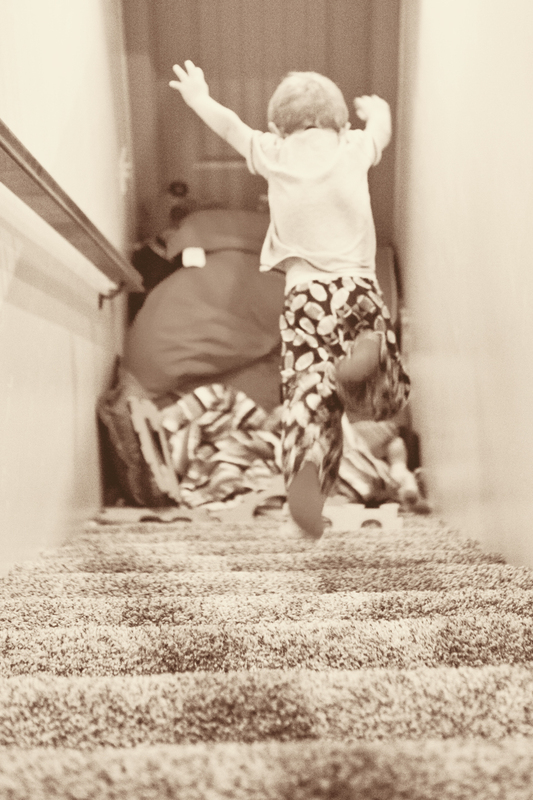 Trevin and Easton had piled every single blanket, pillow, stuffed animal, and any soft toy they could find at the bottom of the stairs. My linen closet was left completely empty, their beds bare, and the couches without pillows. 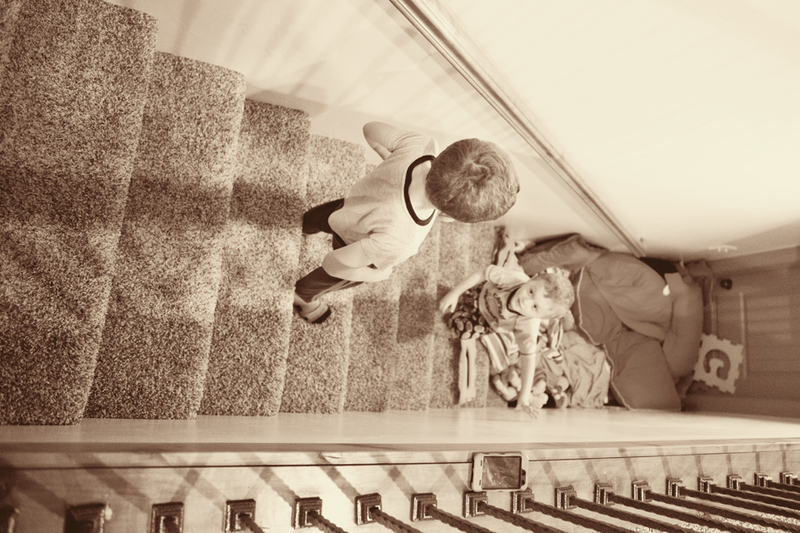 Trevin explained to Easton the door that lead to the basement needed to stay closed at all times so the pile would stay full. 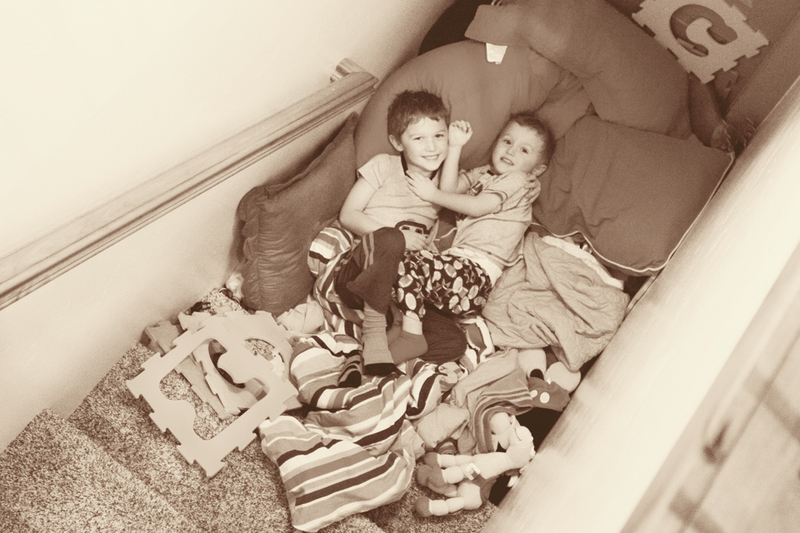 At first it was just a place for the two of them to lay on and then a few minutes later, it turned into much more than just a quiet place to play. 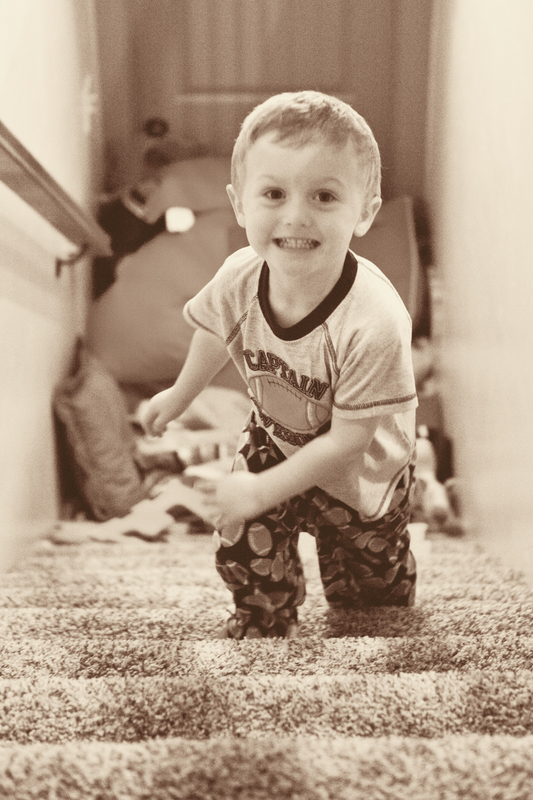 Trevin sat on about the fourth step from the top of the stairs thinking to himself. It wasn’t thirty seconds later he said to Easton, “I know what we should call it…The Water Hole!” I was confused by the name at first and then realized they had been watching their new favorite movie The Smurfs all day long (the Water Hole came from the movie and the Smurfs jump in the magic Water Hole in order to transport to different worlds). 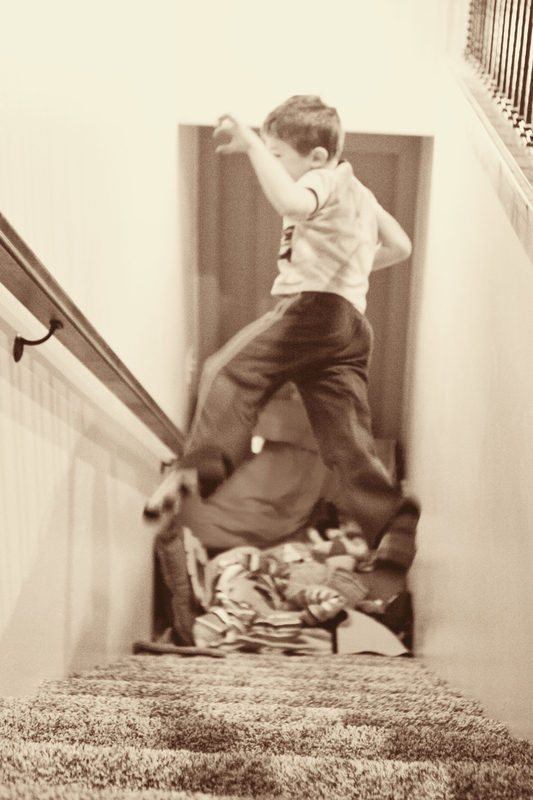 Trevin stands up and immediately jumps in the air, does a karate move, and lands in the pile of softness at the bottom of the stairs. Eventually Easton got brave and started jumping into The Water Hole himself! The night was full of twists, tricks, giggles, and fun for my two boys. 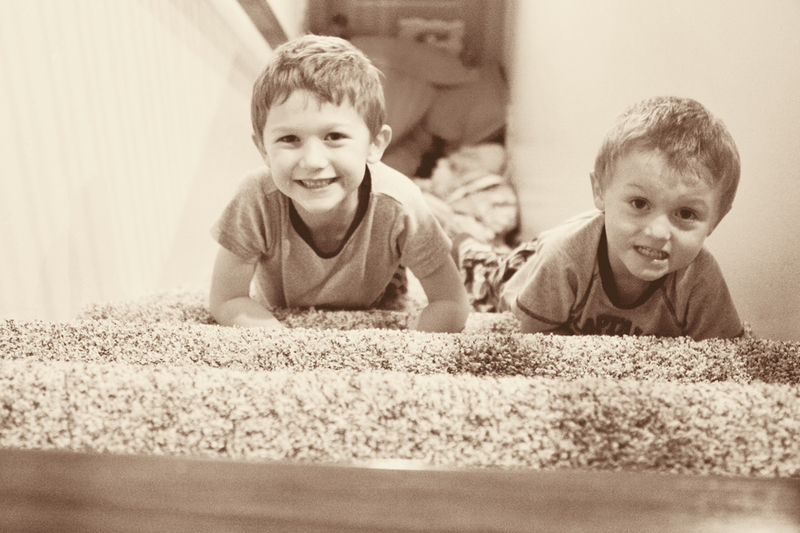 I decided to let them play and enjoy the moment hoping they wouldn’t hit their head or miss the blankets completely. They enjoyed showing me their tricks and free falling into The Water Hole like the little Smurfs do on the movie. 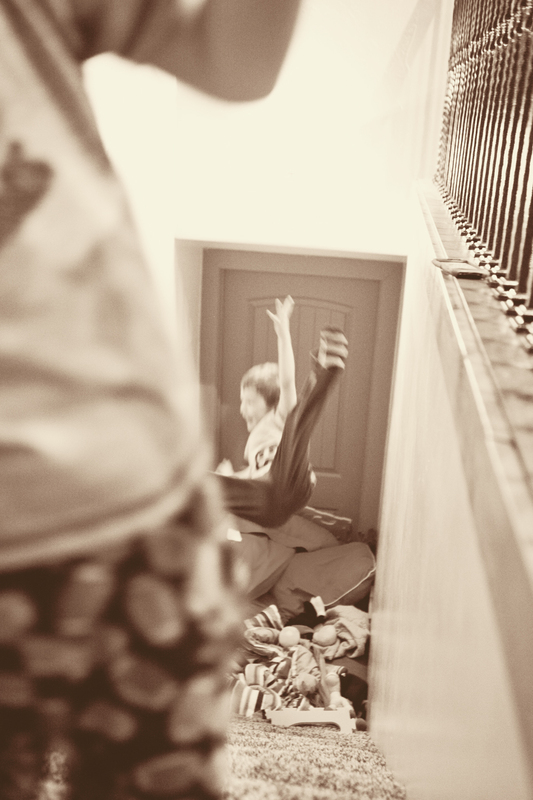 As a mother, this was one of those moments when the life of raising two little boys can be wild! My anxiety was building as I thought more and more about their safety. Eventually I made them pick up The Water Hole and was actually very mad at how many blankets and towels I had to refold, beds that had to be remade, and pillows that had to be replaced. I couldn’t believe the amount of “stuff” that was at the bottom of the stairs. I got upset and went into my room. I sat there thinking to myself about my life and my family. I came to the realization that this is how my life is going to be and that I needed to embrace it with happiness no matter how wild it may get. My boys are my life and this is what boys do. They wrestle, fight (and get over it), tackle each other, burp, pee on the toilet (and leave the seat up), and make messes that drive me mad. However, they make me laugh, tell me they love me constantly, they enjoy the small things life has to offer, and love each other as well. They are the reason I get up every morning. They are my life! 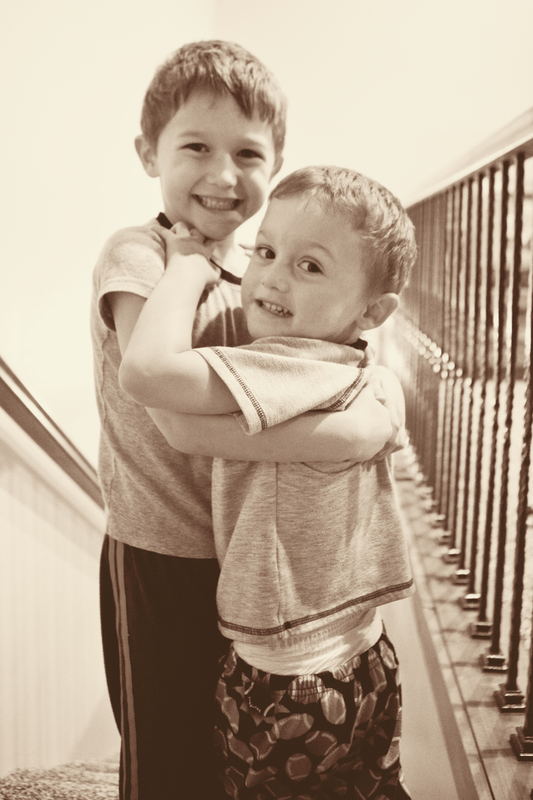 And one things for sure…..I really do love the life of raising two little boys!